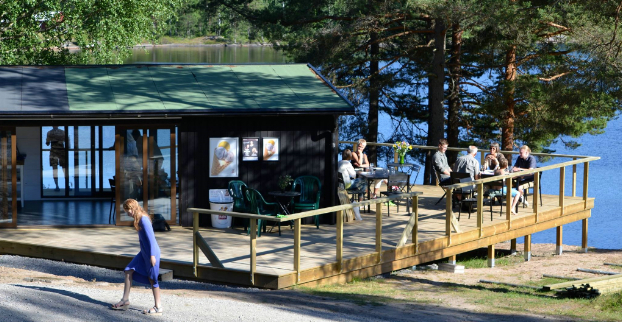 Grums Fish n´ Camp by Lake Sävsjön is a peaceful family campsite set in a scenic district with many cultural traditions in southern Värmland. Come here to relax, enjoy nature walks, swim, and fish or take trips by boat. The campsite is located by scenic Lake Sävsjön in the south of Värmland, ca 12 km south of Grums. We have some 40 camping pitches, all with electric hook-up. Some are especially suitable for motorhomes and others are great for tents. From Sävsjön you are also close to golf courses, shopping, exciting activities and culture. We are happy to offer suggestions on sights and outings to make in the surrounding area. As our guest you are close to the beach and jetties for swimming, barbecue spots, and boat and canoe rentals. We have a sauna, floating jetty, boats and canoes for hire. Basic fishing equipment can be hired or purchased. Sävsjön has lovely waters for fishing pike, perch and pike-perch. We also sell fishing permits to other lakes and watercourses. We have a kiosk where you can buy some dairy products and groceries, locally produced meat, fishing equipment, ice cream, coffee, drinks and snacks. We have five rental cabins. All have 4 beds (2 bunk beds) and dining area equipped for 4 people. There is also a fridge, hot plate, coffee maker and micro. The cottages face southwest with views over the lake. Shower, WC and washing up room are available to our guests in the centrally located service buildings on the grounds.